Weight loss exercise is designed primarily to make you physically active, increase your body’s metabolic rate (BMR) and to burn fat. Aerobics, walking, jogging and swimming are great weight loss exercises. A sedentary lifestyle is blamed for obesity and being overweight and so we need to engage in some form of physical activity. In Malaysia, aerobics, zumba and various group fitness programs are designed to give you a great workout and to sweat it out for about 40 minutes to an hour for a 300 to 400 calorie burn. However your body being inactive for some time now, may not be able to cope with the physical strain of these high energy exercises, jogging included. The exercise ball and stair trainer might be stressful for you at first if you do not have someone on hand to help you. Similarly, weight training will be strenuous on your body, but if you can, this is the most effective fat burning form of exercise. Be aware though, it does build up muscle, so you may see weight loss and improve fitness levels, as fat loss will increase with muscle gain. You need to enter into a weight loss exercise slowly and steadily, allowing your body to cope with the increased physical demands. So brisk walking for 30 minutes is highly recommended by doctors. This should get you to lose around 200 to 300 calories per session and is less stressful on the joints than jogging and aerobics with almost similar fat burn results. You can go brisk walking around the neighbourhood or at the treadmill at the gym. You will need to get proper walking shoes and not cross trainers to ensure you get an effective workout. 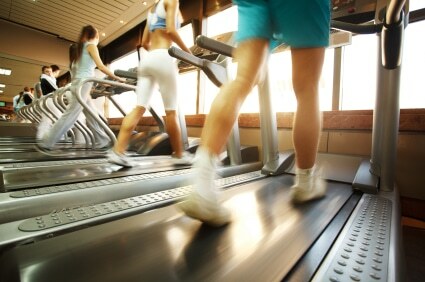 Treadmills and exercise bicycles are the best forms of weight loss exercise for the newly active. So a club membership at a reputable fitness centre will be useful. Make sure though that they have a lot of the exercise machines (and well maintained too) that you plan on using, as the machines might get fully occupied during peak hours. Swimming for 30 minutes should see you lose around 300 to 400 calories. All in all exercise is great for burning calories and preventing fat build up. However you need to note that any form of exercise may take quite a long period of time to burn visceral fat. That is why belly fat is the most difficult to get rid off and this is where supplements in the form of fat burners come in to help in mobilising visceral fat.